Can we please retire this expression? 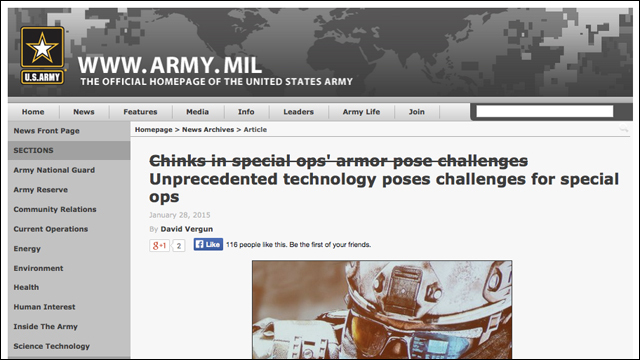 Folks, I've said this before, but can we please retire the phrase "chink in the armor"? I know this is a legit, centuries-old expression, meaning "a vulnerable area," but its usage today just does not look or sound right and makes for awkward moments, regardless of intent. Our latest offender: the United States Army. On Thursday afternoon, the Army's official Twitter account posted a tweet referring "chinks" in the armor of its special ops capabilities. The tweet, which prompted several accusations of racism, has since been deleted. Obviously, it was statement about vulnerabilities. 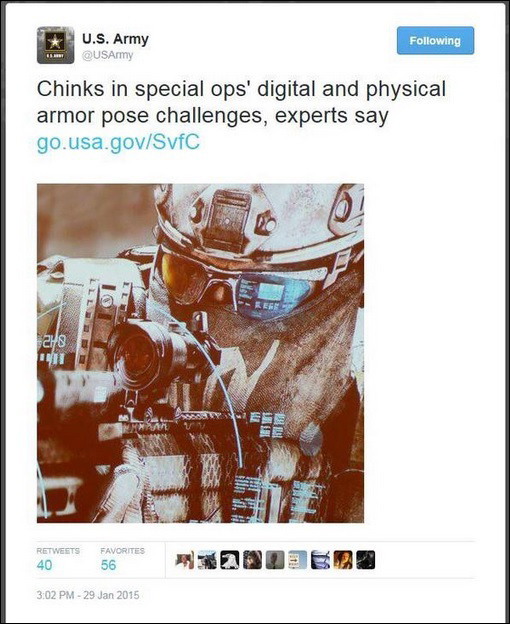 The tweet read, "Chinks in special ops' digital and physical armor poses challenges, experts say," accompanied by an image and link to an Army news release with a similar headline (which has since been changed). We get it, Army. But there has to be a better way to express this. A way that does not employ a racial slur. According to the Washington Post, the Army is standing by its use of the expression. Army public affairs officer Lt. Col. Alayne Conway says that the service was surprised by the reaction "since there is nothing even remotely racial" in the expression. Yet they chose to delete the tweet. The @USArmy has decided to take down its racially insensitive tweet from earlier today making reference to "chinks". But, no apology? Is there a meaning that this expression captures that cannot be substituted by other, less racist words?